Find a great sale price on the 2016 Toyota Tacoma 2WD Double Cab V6 AT TRD Off Road at Bell Road Toyota. The 2016 Toyota Tacoma is located at our Toyota dealership in Phoenix. So if you're looking for a great price on the 2016 Toyota Tacoma 2WD Double Cab V6 AT TRD Off Road or just looking to get an auto loan for the vehicle you want... you've come to the right place! 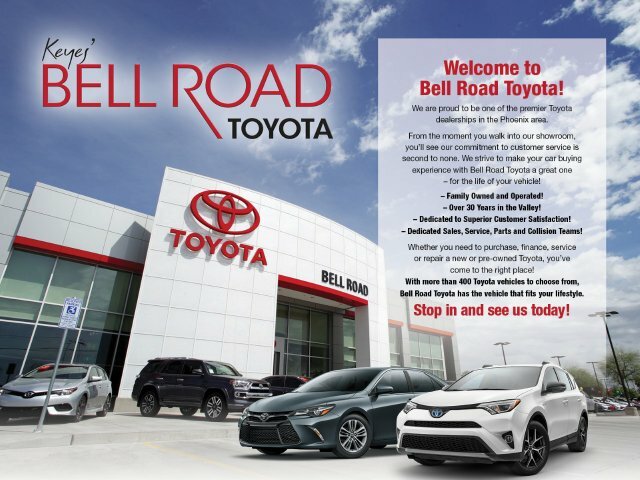 Bell Road Toyota. Come see this 2016 Toyota Tacoma . Its Automatic transmission and Regular Unleaded V-6 3.5 L/211 engine will keep you going. This Toyota Tacoma has the following options: CARPET FLOOR MATS -inc: Door Sill Protectors, Variable Intermittent Wipers, Trip Computer, Transmission: 6-Speed Automatic -inc: electronic shift and gated shifter, Tailgate/Rear Door Lock Included w/Power Door Locks, Tailgate Rear Cargo Access, Streaming Audio, Steel Spare Wheel, Sliding Rear Window, and Single Stainless Steel Exhaust. Test drive this vehicle at Bell Road Toyota, 2020 West Bell Road, Phoenix, AZ 85023.